Type 9 gearbox, Haynes roadster as book foot pedals, I use the standard clutch cable pulled by the pedal, the cable then goes forward along the side of the engine approx 18 inches to 2 feet and then hairpins back to the lever on the side of the type 9. Because it is a relatively sharp 180 bend the pedal is stiff to move, but actuates fine. I was wondering about a short cable to a bracket on the engine mount. Then a simple lever and solid rod, or cable inner back to the clutch lever, removing the 180 degree bend in the cable but not sure on space or where to get cables made. The issue is I do not wish to have to remove and split engine and gearbox during driving time. Any ideas or other that have already solved this issue. Why do I have to make the tools to finish the job? More time then money. I have a pulley on mine, very simple, light clutch and no additional cable wear,. A pulley as in a wheel style thing? With the pulley where is it mounted and would I assume just an inner cable no outer, how do you allow for movement between chassis and engine box, I appreciate there is not much movement. 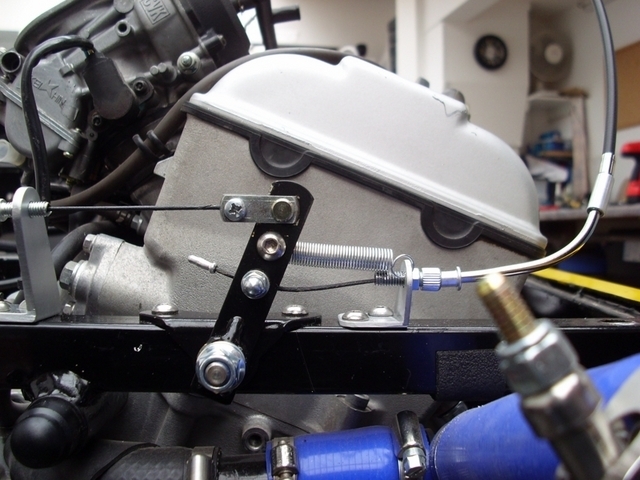 I used a 2:1 ratio lever for the throttle cable on the bike engine. A beefier version should be ok for a clutch? I can just about make something out to the front of the engine mount, is that correct oram I looking at the wrong thing? It looks like a solid tube going to it? I may have an old cable I can cut down and play with. My car has a type nine using a cable operated clutch with no problems with pedal pressure , what engine and clutch are you using? Can you not fit a longer cable so there is a gentler bend in it? The engine is a 1.8 CVH and clutch , gearbox etc are all standard. If I remove the cable clean out and lightly lube it is fine for a while and then gets stiffer, also I am starting to have ankle issues so it would be a great help to make it easier. As it is the cable goes forward of the engine mount and then 180 back and the bends is probably a radio of 2.5 inches that it forms naturally, so I think I end up with steel on steel on the inside I tend to think it has worn through the nylon sheath. So keeping the cable short and trying a lever or similar system where I can can adjust the pivot point could help me a lot. If lubricating the cable helps for a while I would suspect the cable has worn the outer casing , a new cable is about a tenner . If you want to try a different length Burtonpowers catalogue used to list details. Looking at the picture the part in the vice will fit into the hole for the clutch cable, the smaller hole at the bottom is for a 10mm hole in the bottom of the gearbox housing that gets used by the filler plate. The lever has around 35mm travel, so I think that will be enough. The thing I need to fathom is what tool and ferrules do I need to crimp to the clutch cable has anyone done that type of thing? The AA carry screw on type fittings to make up cables but no idea where you get them from. Seems a clever but complicated way of avoiding using a longer cable with a bigger rad though. Although not ideal, Could you not fit the fixed end of the sheath to the clutch lever and the actuating end to the fixed point on the chassis or block or transmission casing? If you send me your e mail, I can send Technical (Very technical) drawing. Probably, but it is just a variation to HowardB's pulley system. If I used a longer clutch cable I would have to get one and then fit that to the haynes foot pedal and also secure it around the side of the engine and steering column. Anyway we each have our own way to crack a nut. When I removed the cable from the car it had over the years formed itself in to the shape some of the plastc was going semi hard holding the shape and that included the inner, I also got crap out of the cabnle when I cut it in half so that would not have helped. I fitted the assembly to the yesterday and finished tidy up in the garage about 22:00 so no pics or update last night. Here it is in the car, trying to get a camera in among the pipes/oil filter/inlet manifold etc. Can not post to the photo archive so doing it from my own pages. There are now adjusting nuts mounted in the top arm that can be screwed in and out to allow for cable and biting point adjustment. I have also as a temp measure used M10 bolts/nuts with a hole through the side to crimp and hold the cable in place until I can find a better way, it will probably be permanent for the next X years. The outer sheath is now approx 8 inches in length, the steel tubes acts as the outer sheath where it is going to the gearbox. 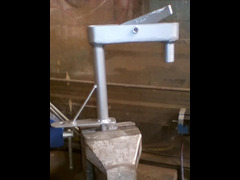 The lever just turns the action through 180 degrees. One thing I should have done and will do when I next have cause to remove it is add another set of pivot holes in the lever and case to the side of centre, so that if nee3ded I can either get more pedal movement/less force on the clutch pedal. 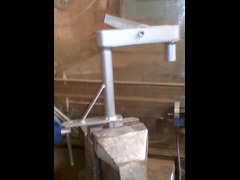 The pedal is easier when quickly tested last night, just need to tidy it up a bit and add a cover to keep the crap out. Surely it would have been an excellent time to convert to a lovely hydraulic clutch You can get slave cylinders for "pull" operation. Not got a clue, doing a type 9 conversion typically involves engine out, machining the centre stub to fit a modern slave cylinder and a hydraulic foot pedal. The kits out there typically start at £150 to £180 plus you need the pedal assembly. So all in all this kept it quite lo-cost and I did it without removing the engine/gearbox. Although access from underneath would have helped a lot. I did see on turbosport.co.uk some one did it a lot cheaper with some old cylinders still retaining the mechanical clutch lever, but installed a slave cylinder to push the lever forward which meant mounting on the side of the box back into the tunnel, I did not think I could do that due to space. I am sure there are lots of ways in the end, mine was just one way. 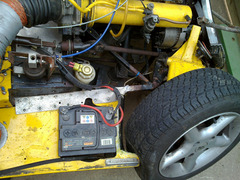 that looks a neat solution, my awful picture essentially shows a pulley that does what you have done with levers Snip.. I looked around the garage and my scrap metal bits to see if I could machine a pulley, gave up and did it by lever, as it stands now, there is no mechanical advantage, same effort as your pulley method. A lot better then it was. Last bit on it will be some cover to stop water and crud from getting to it, some sort of vinyl glove/wrap probably. Think that might answer the question as to why your clutch had a problem?